Flight nursing in the United States Army Air Forces had become a reality when the 802nd Medical Air Evacuation Transport Squadron left Bowman Field, Kentucky on Christmas Day 1942 for flying duty overseas in North Africa. Lauretta Schimmoler’s Aerial Nurse Corps of America (ANCOA), however, never really “got off the ground”. Despite Schimmoler’s pronouncement to ANCOA member Leora B. Stroup in January 1942 that “ANCOA shall never die,” the organization apparently did die a slow death after the outbreak of World War II when, as part of the national defense program, civilian aircraft were removed from the west coast to inland bases, thus eliminating ANCOA training flights, and a hold was placed on air shows. 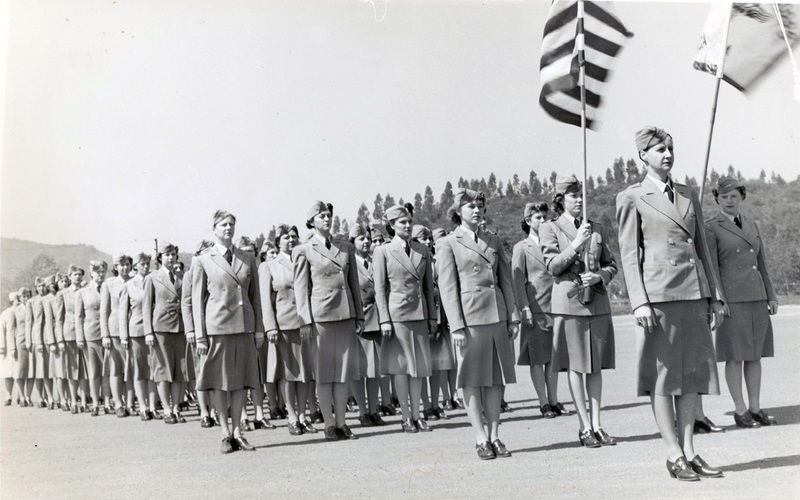 1 ANCOA nurses who were by regulation members of the American Red Cross First Reserve were mobilized for active duty with the military. Some of them, including Stroup, served with distinction as flight nurses with the Army Air Forces – some one hundred of them, according to an uncorroborated newspaper account. 2 Schimmoler, in her early forties by then, was past the age limit for government flying in the WASP [Women Airforce Service Pilots] program. 3 By Schimmoler’s account, she was apparently recommended for an appointment in the WAAC [Women’s Auxiliary Army Corps] prior to June 1942 but chose not to consider it, because she was completing a course on aircraft engines and was holding out for civilian rather than military wartime service. 4 Not being a nurse, military flight nursing was not an option for her. This story is pure fiction, but the idea is real and vital. There are no Parachute Nurses attached to the Army today, there are none doing the actual training in jumping, but there is a Paranurse Division of the Medical Department of the Aviation Emergency Corps and the part these Paranurses may play in the defense of and aid to the United States may make the fiction of today the reality of tomorrow. After her film debut, with ANCOA no longer a viable civilian organization, Schimmoler closed her offices in Burbank, turned her clerical staff over to the War Operations Center of the Los Angeles County Sheriff’s Department, and considered her next step. Not willing to sever her connections with aviation, she worked first as an air traffic controller trainee for the Civil Aeronautics Administration in 1942 and as an inspector for the United States Navy Bureau of Aeronautics in 1943 before enlisting in the Army as a WAC [Women’s Army Corps] in 1944. 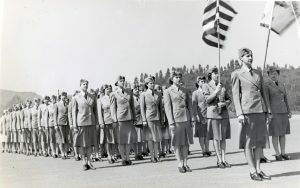 After completing basic training in Des Moines, Iowa, Private Schimmoler was sent to California’s Fairfield-Suisun Army Air Base – renamed Travis Air Force Base in 1951 – where she was assigned duty in base operations as a dispatcher, “since they could not find a place for me to serve direct in Air Evac”. 12 Schimmoler was alone on duty one night in 1944 when the first C–54 Skymaster air evacuation flight from the Pacific Theater of Operations touched down safely on her watch. She recalled that being present for the arrival of this plane “was gratification which no amount of money could purchase”. 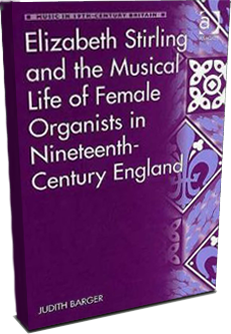 13 She continued: “When the first stretcher made its appearance in the open door of the plane and they began to move slowly down the ladder, I was overcome by it all for the moment. I said aloud, ‘And they said it wouldn’t be done.’” 14 It may have been a bittersweet moment for Schimmoler, however, to see that her dream had become a reality – but not for ANCOA. 1 Lauretta M. Schimmoler, letter to Leora B. Stroup, 17 Jan 1942; Lauretta M. Schimmoler, letter to H.A. Coleman, 22 Mar 1945. 2 Katherine V. Sinks, “Aviatrix Joins Air Wacs,” Glendale (California) News-Press, 27 July 1944. 3 Dora D. Strother, “The W.A.S.P. Program: An Historical Synopsis,” AF Museum Research Division, Wright-Patterson AFB, OH, Apr 1972, 11. [AFHRA K220.0721–19] The cut-off age was 35. 4 Lauretta Schimmoler, letter to Leora B. Stroup, 26 Jun 1942. 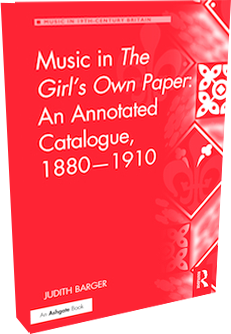 6 Schimmoler, letter to Stroup, 17 Jan 1942; Lauretta M. Schimmoler, letter to Leora B. Stroup, 5 Mar 1942; Lida Dolan for Lauretta M. Schimmoler, letter to Leora Stroup, 2 Apr 1942; Lauretta Schimmoler, letter to Leora B. Stroup, 26 Jun 1942. 7 Lauretta M. Schimmoler, letter to Frank, 13 Apr 1942; Esther Smith, “Ex-Bucyrus Airport Manager Turns to Movies,” Mansfield News-Journal, 16 Aug 1942. The recipient may have been F.L. Hopley of Bucyrus, OH. 8 “’Parachute Nurse’ Timely; ‘Halfway to Shanghai’ Fair,” Hollywood Reporter, 8 (Sep 1942): 4. 9 Rian, “Parachute Nurse,” n.p. 10 “Parachute Nurses?” RN 5 (Feb 1942): 56. 15 Ibid., 7. Matilda D. Grinevich was a career Air Force nurse who had several air evacuation assignments; her first was with the 801 MAES in the Pacific in World War II. 16 “Lauretta Schimmoler Receives Honorary U.S. Air Force Flight Nurse Certificate and Wings,” Aerospace Medical Association, 37th Annual Meeting, Las Vegas, Nevada, press release, 20 Apr 1966; “Miss Schimmoler Awarded Honorary Flight Nurse Certificate and Wings,” Journal of Aerospace Medicine 37 (Jul 1966): 757, 759. Former ANCOA nurses Leora Stroup, Eileen Newbeck, Margaret Gudoba, and Matilda Grinevich all served as flight nurses in the US Army Air Forces in World War II. 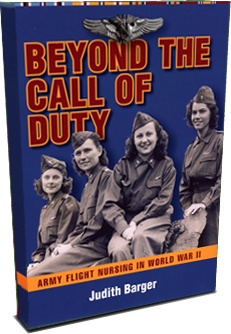 To learn how the dream of flight nursing as part of air evacuation in the US military became a reality, see Beyond the Call of Duty: Army Flight Nursing in World War II (Kent State University Press, 2013).